This sprayhood was going to be a tricky one as we had no access to the boat (it was moored in Greece) and no bars to work from and the owner needed to install the completed hood himself. 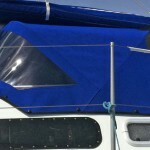 Fortunately, we found a similar boat and managed to take a pattern of the bars and hood. 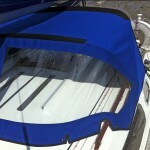 This may sound relatively simple but, more often than not, there are variations in one boat to another and installing the cover can be tricky. However, the customer was over the moon as everything went as expected.